This is a rectangular Gasoline and Puritan Motor Oils porcelain sign. This particular Gasoline and Puritan Motor Oils sign is black with red and white text. 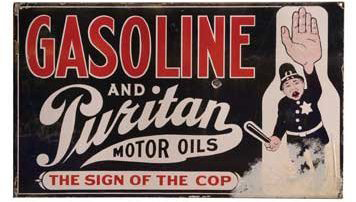 It reads, “Gasoline and Puritan Motor Oils, The Sign Of The Cop” and features a policeman dressed in black and holding up a hand on the right side of the sign.